VIASURE Real Time PCR Detection Kits is the product range of CerTest Biotec for the detection of infectious diseases using molecular biology techniques. VIASURE will be present once again at the ECCMID exhibition, which will take place this year in Amsterdam, where the company will convert its exhibition space in the socalled “House of RT-PCR”, offering to all visitors its wide panel of solutions for diagnosis. Save the dates, from April 13 to 16. One more year, CerTest will participate in ECCMID, which in 2019 reaches its 29th edition. This is the main event of Clinical Microbiology and Infectious Diseases worldwide, bringing together experts from around the world for an audience of more than 12,000 attendees. Through its four business units, but mainly focused on VIASURE -diagnosis through the use of molecular biology techniques-, CerTest will show all its potential, know-how and excellent results of its solutions for in vitro diagnostics. • CerTest bioSCIENCE: raw materials for life science and immunoassays. • CerTest Turbilatex, for the detection and quantification of tumor and inflammatory markers. 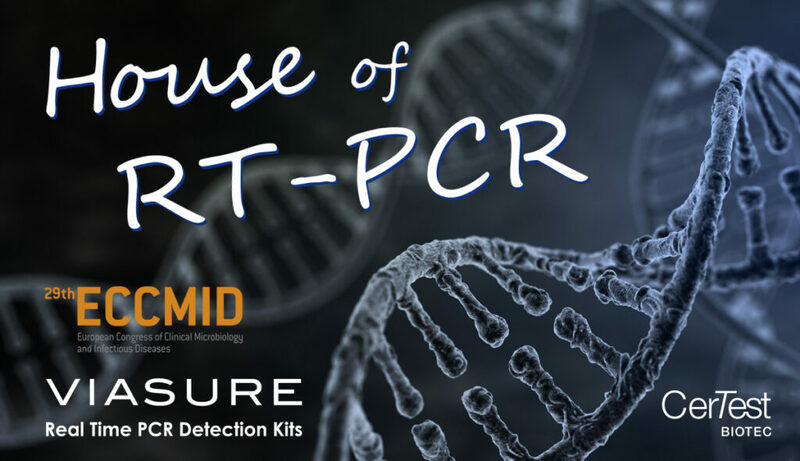 • VIASURE Real Time PCR Detection Kits, which allows to identify pathogenic agents that cause infectious diseases by amplifying fragments of DNA. In addition to the exhibition area, the exhibition organization has developed a complete program that includes lectures, oral sessions and interactive workshops. (11/2018) CerTest Biotec receives the recognition “SME creation of employment” and “SME international development” granted by CEPYME.